Another dorky and uninspired post title… unfortunately the naming mojo just rarely visits me. 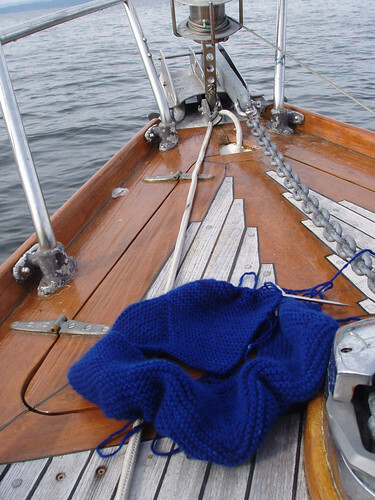 Went home to Vancouver Island, my place of origin, and my parents graciously took me out on a spectacular sailing trip, and didn’t complain when I just knit and didn’t want to crank on winches much. The weather was SO much better than the weatherman had warned, and we went to Rebekah Spit on Quadra Island, and saw HUGE stinging jellyfish washed up on the beach, and ate well. It was a cool but sunny fall breeze when we sailed back on Sunday, and it only started to pour once we got back to the house! Well the February Lady Sweater is coming along beautifully… But I’m kind of afraid I might run out of yarn prematurely…. What to do? The yarn is 100% cashmere that I recycled from a thrifted sweater, and painstakingly (yeah, it took 2 attempts) dyed into a very happy shade of blue. I do have another recycled cashmere that I could use with it, but no way could I match the colour… but maybe I’ll have enough after all that.